Architect Miguel Marcelino’s gorgeous Three Courtyards House is a modern rustic oasis in remote Benavente, Portugal. 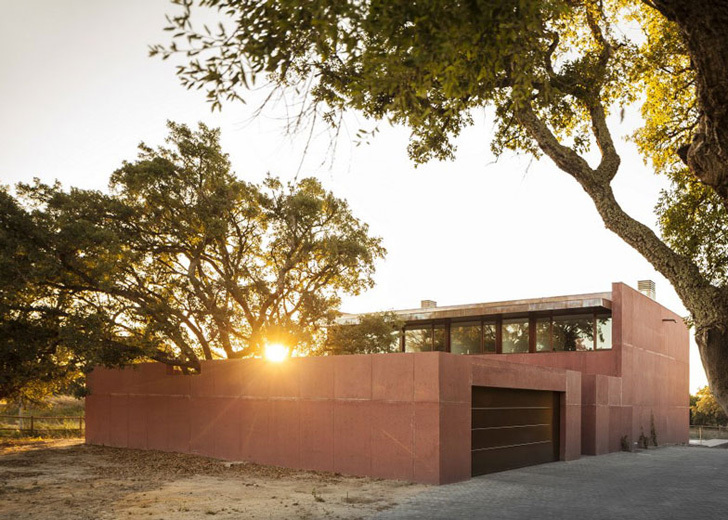 Designed to accentuate the natural beauty of the land, the flat home hugs a thick cork oak tree that provides shade for the home's interior. The three opposing courtyards further connect the home with the picturesque landscape, giving each room a different vista for the family to enjoy as the sun moves throughout the day. Miguel Marcelino constructed the minimalist home in concrete, which keeps the interior naturally cool in the hot Portuguese climate. The house was designed with glass curtains at ground level and concrete brise soleils around the second floor to keep out direct sunlight. The north side of the home has the best view of the surrounding terrain, so Marcelino built the largest of the three courtyards here. Gently sloping steps lead out of an open courtyard and into the pool. The pool is sunken so that it doesn’t interrupt the view. A line of glass curtains face the steps so that the family has the same view inside or outside the house. The southern façade’s courtyard holds the cork tree, and the family may dine under its boughs at a great outdoor kitchen. This enclosed courtyard is more secluded, giving the residents privacy while being outdoors. The third courtyard caters towards the vista, framing the view of the nearby lake. This courtyard is protected by double walls which block winds. The earthen-colored Three Courtyards House seems to rise out of the Portuguese landscape, allowing the family within to live harmoniously with the land. Miguel Marcelino constructed the minimalist home in concrete, which keeps the interior naturally cool in the hot Portuguese climate. The house was designed with glass curtains at ground level and concrete brise soleils around the second floor to keep out direct sunlight. The southern façade’s courtyard holds the cork tree, and the family may dine under its boughs at a great outdoor kitchen. Gently sloping steps lead out of an open courtyard and into the pool. The pool is sunken so that it doesn't interrupt the view. A line of glass curtains face the steps so that the family has the same view inside or outside the house. The north side of the home has the best view of the surrounding terrain, so Marcelino built the largest of the three courtyards here. 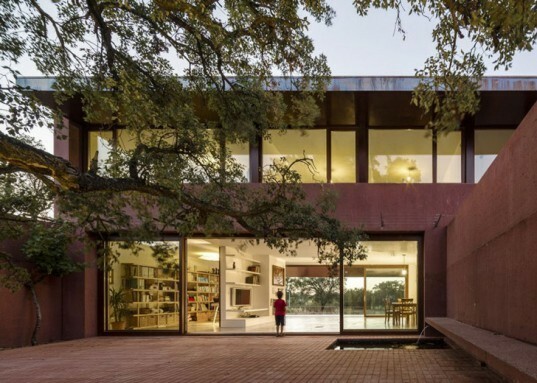 The earthen-colored Three Courtyards House seems to rise out of the Portuguese landscape, allowing the family within to live harmoniously with the land.